Industrial Rigging Inspection Services | Holloway Houston, Inc.
HHI is committed to provide thorough and cost-effective rigging inspection services that comply with all procedures recommended by ASME, OSHA, and manufacturers. Staffed by a team of engineers with extensive knowledge and an outstanding industry reputation, our Rigging Inspection Department works with you during every step of your operation to ensure that your rigging meets the highest standards of integrity and safety. All HHI rigging inspections come complete with a detailed visual report on rigging conditions. If we note defects in standard or custom rigs, we’ll also offer repair recommendations and action steps to improve safety and comply with applicable regulations. 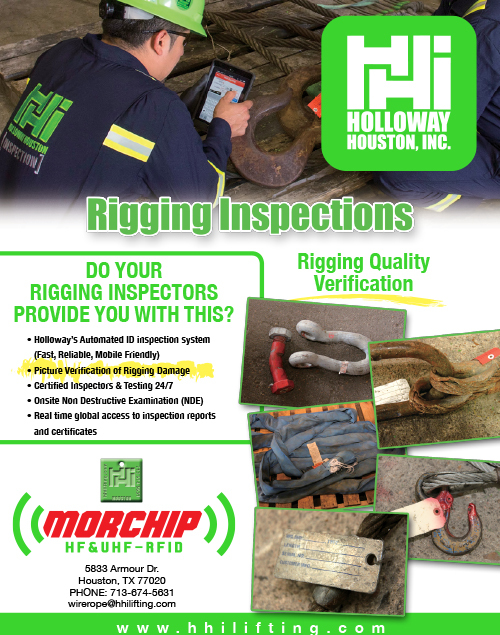 For more information on HHI rigging inspection services, please contact a knowledgeable HHI representative today.